Last week, I said that I was going to aim at 2 blogs a week. I did manage three in actual fact, but I chose to keep one in my drafts for now. Perhaps I will post it later in the week. I think I need to let it age, like a good wine. It is now the third week of semester. I am finding it a smoother semester than the one that just past but it is going just as quickly! A young girl visits her Grandma and ‘brightens her dreams’ whilst her little brother charms the nursing home residents with his playful antics. I found this book to be heartbreakingly beautiful. 2 children have regular visits to their grandmother who is hospitalised with dementia. 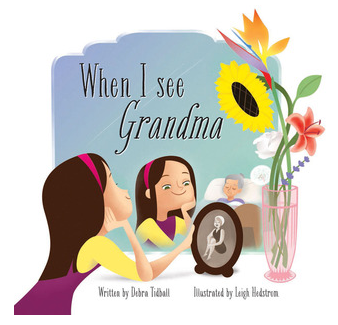 Stories and memories show the grandmother in her youthful life juxtaposed with bedridden self. I wept reading it. I cannot recommend this picture book highly enough especially for those who need to explain dementia to their young children. I borrowed this book from a NSW public library. Over 80 digital reading commentators, practitioners and innovators were asked to predict the future of reading in short passages. This book poses (now no longer) new ideas and this may be that it was published in 2011. We are in such a fast paced world that in the space of four years they cease to be shiny and bright ideas, but then again, that may also be because many of these ideas are discussed regularly in the bookternet and perhaps people who do not follow other bookish innovators will still find these ideas to be fresh and innovative. 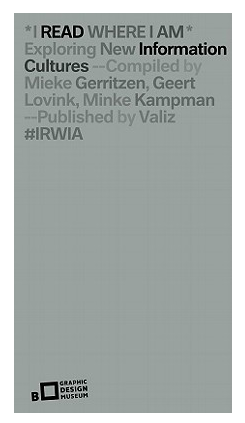 The book’s materiality also takes on design principles that differ somewhat from conventional publications. The layout of the book had an index of word frequency after the contents pages which I have not come across in a print book. Each entry lets you know approximately how long it will take you to read the article from <less than a minute to read to >4minutes. This is a style that is used in my wordpress blog reader, however, in print this is a good inclusion cognizant of the time/space necessities that readers now take into consideration before they start reading. In these days of digitisation and text analysis, the word count for each short article was a welcome inclusion and I would love to see more non-fiction books take up this practice. I also liked the construction of the complex index which included definitions drawn from wikipedia at the end of the book. Despite these positives, I struggled to read the short descriptions as the alternating font shades of grey for each letter in each word distracted my reading. This may have been deliberate by the book designers but I felt it did not allow for a close reading of the ideas being posed. I have an inter-library loan copy of this book through my university. It was recommended to me by a work colleague. This is a graphic novel biography on Steve Jobs. It was a well paced and an easy to read biography. Being in my 40s, Steve Jobs and Apple, along with Bill Gates and Microsoft, are the computer giants that have been everpresent and ever-influential in my life. However, I am not interested enough in either of them to dedicate myself to reading a heavy, text-only tome. I’ve read many news articles and essays on Jobs and this illustrative publication seems is an engaging description of his life. This book succeeds as it is aimed at primary school children, to whom Jobs is now a historic figure – much in the way Alexander Graham Bell was to older generations. 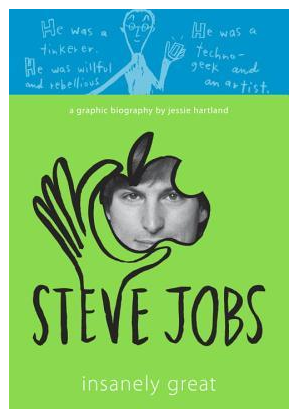 Not only is his life discussed, but it is placed within the context of technology and broader history and its influences on Steve Jobs. I read my nephew’s copy of this book having found it on my sister’s kitchen bench. I lurrrrvvvve the Get Mortified podcast. LOVE IT! Adults reading from their teen diaries makes for cringeworthy, hilariouslistening. This is a travelling stage show and the best of a show is recorded. My favourite (and possibly the most grossly mortifying) episode is number 25 with Ashley: Why I hate the SATs. I laughed so hard I had tears running down my face. Some of the podcasts can be rather rude and perhaps too confronting to listen to them around young kids. You have been warned. The show’s byline is Sharing the Shame and I must say that I think all the readers are incredibly brave to be reading their diaries and letters out loud. Last year, I found an unsent letter I had written to my penpal in France (who I still keep in contact with but now we Facebook together). It looked like a list of all my social media activities – a list of favourite songs, favourite movies, favourite TV, which celebrities were the hottest, what book I am reading, which friends got with which guys. Completely banal and completely mortifying. I stood staring, I considered the quarter of a century between having written it and finding it again, and I still tore it up. Some things do not deserve keeping. I really hope that Get Mortified travels to Australia but there is no way that I would ever grace its stage. Get Mortified was suggested to me by friend, ex-library borrower and Book Blogger extraordinaire, Kat Mayo from BookThingo. [removed] I initially wanted to write a quick, shortish commentary on Kate Breslin’s For Such a Time but it ended up being unyielding and it overwhelmed this post that acts more as an overview of the past week. I have moved it to my drafts for now as I need to gather my thoughts and make them clearer on this topic. I once again put Tessa Dare on the backburner as I just finished reading Lynne Graham’s The Sheik’s Secret Babies…there is a review on the way! You read The Sheikh and his Secret Babies: I can’t wait to hear what you think!!! I did and the post is mostly ready to go! Watch this space!